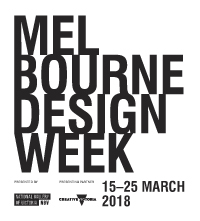 This event is part of Melbourne Design Week an initiative of the Victorian Government in collaboration with the NGV. Meagan Streader and Genevieve Felix Reynolds share a preoccupation with three dimensional space and architecture. This concern is explored in diverse but formally related ways - Streader focuses on light; accessible voids, physical but ephemeral. Felix Reynolds tackles the painting tradition, experimenting in two and three dimensions, with canvas shape and placement. Both artists utilise the language of Euclidian geometry to communicate distinctions between digital, virtual space and physical experience. Paying respects to the traditions of Modernism and Minimalism, both artists generate works that acknowledge, prohibit or re-evaluate the physical gallery space, while flirting with the distinction between the mathematically perfect and the handmade. We move in space through time. We experience art in space and through time. Here, the works of Genevieve Felix Reynolds and Meagan Streader help us understand the importance of physical presence when we experience art in the 21st century. Titled 579X425X337, this exhibition cites the dimensions of the gallery within which the artists mediate our relationship to the physical parameters of the space and the 83 cubic metres it contains. It is impossible to talk about this space without acknowledging time, as both artworks mediate our relationship to this space through lived experience. Our movement within the space dictates our experience of the work. At any given point in time, within extended periods of time and at the culmination of the total time spent within the space, our experience is governed by movement. Throughout art history, there have been countless moments of masculinist triumph regarding the ‘end of painting’ and the opening of spatial relations between art and the architectural space which houses it. A pertinent example would be Malevich’s Black Square 1913. Hung in an upper corner space of his exhibition titled The Last Exhibition of Futurist Painting 0.10, the work was an icon of his Suprematist practice, which prioritised the function of form and colour — paint was used not a means to an end but to exist as end in itself. (1) A black square of paint, for Malevich, demarcated the end of figurative depiction and made a step towards a conceptual understanding of the picture plane. What is perhaps most interesting about this work is the shadowed corner space behind the work. Black Square not only rejected the need to depict or evoke three-dimensional space within the picture plane, it also foregrounded the primacy of the picture plane as an object that exists within space itself. Following this line of thought, Malevich’s Black Square can be understood as a precursory moment to Italian artist Lucia Fontana’s experiments with light. During the early 1950’s Fontana experimented with light and shade by slashing and perforating surfaces which would usually be the support for a painted image plane. The outcome of this process was intended to alert the viewer to the space existing behind the artwork, and in turn, make the audience aware of the space they inhabited in front of the artwork. The title of the exhibition, 579X425X337, carries these modernist sentiments forward to the present. Without laying claim to an end of any one art-form, Felix Reynolds and Streader preserve the possibility of the mediums of painting and light to merge with and respond to the architectural space of the gallery, a site which mostly demands the physical presence of art and its audience. Felix Reynolds’ A new economy 2018 foregrounds the need to experience the physical materiality of art objects. The work echoes the Euclidian geometry of the gallery and the forms it contains. The white and blue border of the left and upper edge of the painting intersect at a white curved section in the corner, creating a moment of lightness (in both senses of the word) which cites Streader’s Shift (corner) 2018. This gesture of lightness creates a significant weight in the lower section of the painting as the density of the blue tones run straight to the lower edge, where a pink strip of paint transitions to solid gold. The composition of this work accelerates our experience of colour through space and in time — the painting curls away from the wall into the space of the viewer at the very moment the picture plane alludes to the weight of its colour. This gesture, for me, shortcuts the modernist challenge of evoking depth of space through a balancing of formal qualities within the painting. A new economy exists in this space as if it is about to gain motion and slip off the wall like a piece of paper falling from a printer. Diagonally across the room, Streader’s work stitches the architectural components that make up the conceptual voids of corner spaces with 14 bright white curved neons. Shift (corner) pushes us away from this space which many rarely approach in a gallery setting. Corners are peculiar spaces in themselves. They denote an end to approachable space yet they are able to offer comfort; corners can offer a tender embrace for a leaning body. Streader’s work illuminates this peculiar space, drawing our eyes to a void that is now ever-present. At the moment we are given the opportunity to realise this space through light, we become aware that we are positioned in front of a barrier. As we approach it we are asked to turn back and survey what is left of this space. Coming back to A new economy, I realise the space between the curved aluminium panel and the wall is shadowed in variations of light and also has enigmatic depth. Two fluorescent lights installed above and adjacent to the work create a distinct shadow edge that runs vertically from the painting’s left edge. Protruding from this shadow edge and away from the space below the painting is another shadow form imposed by the neons of Shift (corner). At some points in time, an audience exists between A new economy and Shift (corner). In speaking about these works, the audience may come to find that their dialogue is governed not only by their physical experience of the art, but also through their presence in the space which houses it. 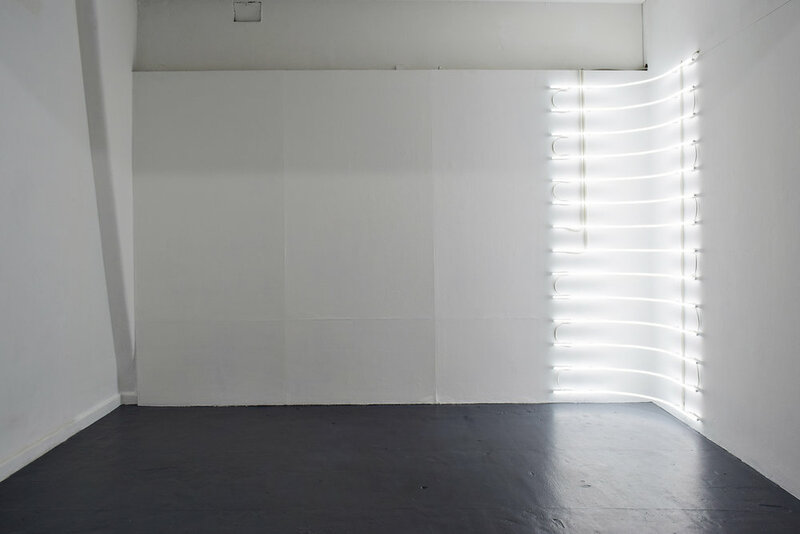 (2) Anthony White, 'Tv and Not Tv: Lucio Fontana's "Luminous Images in Movement"', Grey Room, no. 34, 2009, pp. 6-27. Faced with the digital abstraction of contemporary society, Genevieve Felix Reynolds responds with the abstraction of objects and space in an exploration of the impact of contemporary technologies on painting. The mythos of classical art and architecture anchors her image making; contrasting the weight of historic objects against efficient, reproducible technologies and the pleasure-seeking immediacy of our post-internet generation. Abstractions of artefacts are framed as objects of new idolisation. Refreshed and disembodied in paint, they simultaneously crave and mock a slower, simpler platonic era. Reynolds graduated from the Queensland College of Art (QCP) with first class honours in 2011. Recent exhibitions include Chasm Gallery, New York, Michael Reid, Murrurundi, The Brisbane Powerhouse and Nicholas Thompson, Melbourne. She has been the recipient of several awards and grants including the Godfrey River’s Medal and an Art Start Grant, and was recently a finalist in the Churchie Emerging Artist Award and the Fisher’s Ghost Award. She is currently director of the artist-run gallery Wellington Street Projects in Sydney. Meagan Streader’s work pushes the limits of light within sculpture and installation. 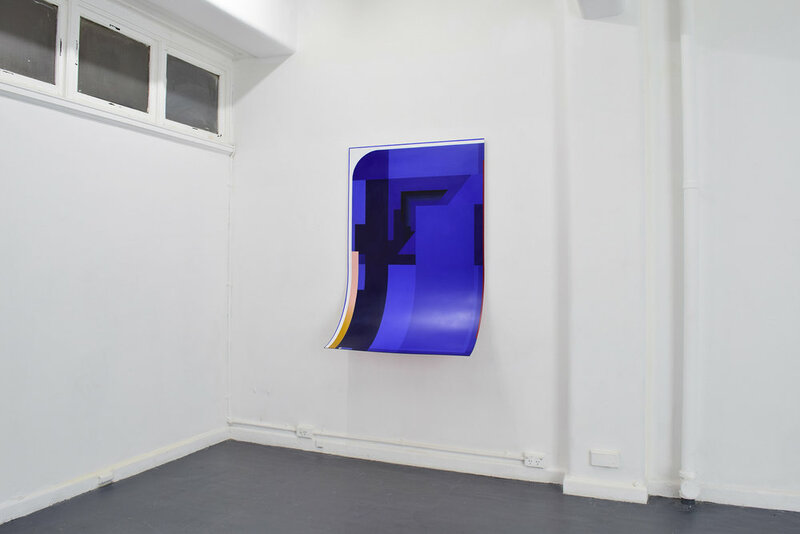 Streader manipulates, reinterprets and extends upon the boundaries of constructed spaces. Through site-specific interventions, her multidimensional use of light re-orientates the viewer’s relationship to the pre-existing architecture and scale of a given space. In this way, Streader’s work reveals the pervasive role of light in governing physical and social navigations of fabricated spaces. Currently based in Melbourne, Australia. IMAGE | Meagan Streader, One-Quarter U-Bend Column, 2017, light sculpture. | Courtesy the artist.